Belkin sent all three kits, so I put them through their paces on my expanding WeMo network. In this review, I'll give an overview of each product, then talk about how they all worked in the Hands On section. Summary Starter Set with two color tunable white LED A19 bulbs and one Belkin WeMo Link. Other than the OSRAM Lightify Logo printed on the base, the new "tunable" bulb looks pretty much like the WeMo Smart LED Bulb reviewed in our Smart LED Light Bulb Kit Roundup in February. The only real difference is that you can vary the color temperature of the OSRAM Lightify bulb from a very warm 2700 Kelvin yellowish-white light all the way up to a very bluish-white 6500 Kelvin. You cannot program the bulb to any color as you can the Philps Hue. For reference, the standard WeMo Smart LED has a fixed color temperature of 3000 Kelvin. As with all WeMo lighting products, the OSRAM Lightify Tunable lights are fully dimmable. 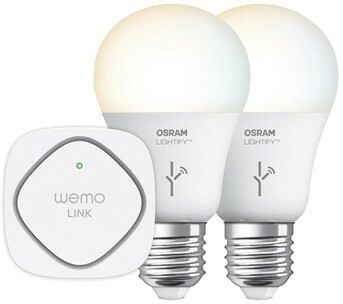 The rating on the side of the bulb shows an output of 805 lumens and a current draw of 9.5 W. The Starter Set which includes the WeMo Link hub and two tunable bulbs lists for $99.99 with individual tunable bulbs available to expand your existing WeMo network for $29.99 each. The OSRAM Lightify integrates nicely into the WeMo environment. The composite image below (left) shows the tunable light bulb as OSRAM Lightify TW60 01. As you add additional tunable bulbs, they are automatically named OSRAM Lightify TW60 02, TW60 03, and so on. Of course, you can rename any WeMo device to something more meaningful to you. The icon for the the light is slightly different from the icon for the standard WeMo light so you can easily identify which ones are tunable and which ones aren't after you rename them. The image on the left below shows the traditional WeMo brightness slider control. Below that you'll see "Color Temperature". The color in the icon indicates the currently set color temperature and will change to reflect different colors. If you tap on the ">" at the edge of the screen, you'll be taken to the color temperature control. The center and right images show the Color Temperature control. At the top of the screen, there's a color swatch that represents the current color temperature. Across the bottom of the screen, there are five preset color temperatures you can choose from. From left to right (yellow to blue) the presets are 2700K, 3550K, 4000K, 4500K, and 6500K. You can also tap anywhere within the colored circle to set your own color. The center image shows 2849K - a color I selected.